A list of reports, articles, or published letters about transport agencies or transport-related matters. October 2015: Progress with technical aspects – such as reaching design solutions, developing procurement options, and budget management – has been strong. But Auckland Transport needs to improve the focus on relationships with stakeholders, contractor performance, and the benefits delivered to date, as part of the monitoring and reporting. We made 12 recommendations to help Auckland Transport strengthen AMETI’s governance, accountability, and programme management arrangements. March 2013, ISBN 978-0-478-41015-0 (print), ISBN 978-0-478-41016-7 (online). 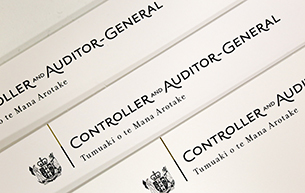 March 2012: This document gives an overview of the role of the Auditor-General and outlines the kind of advice and support that the Transport and Industrial Relations Committee can expect from us. It also provides a description of the transport sector and its strategic significance, and describes our work in general and, specifically, in the transport sector. August 1992, ISBN 0 477 02833 0. March 1989, ISBN 0 477 02809 8. March 1987, ISBN 0 477 02800 4.